Born in Brookneal, Virginia, November 18, 1890, Lewis Andrew Pick graduated from Virginia Polytechnic Institute in 1914. During World War I he served with the 23rd Engineers in France. Pick received his Regular Army commission in the Corps of Engineers on July 1, 1920. He served in the Philippines from 1921 until 1923 and helped organize an engineer regiment composed of Filipino soldiers. He was District Engineer at New Orleans during the great 1927 Mississippi River floods, and he helped coordinate federal relief efforts. Pick was named Missouri River Division Engineer in 1942, and with W. Glenn Sloan of the Bureau of Reclamation he co-wrote the Pick-Sloan Plan for controlling the water resources of the Missouri River Basin. 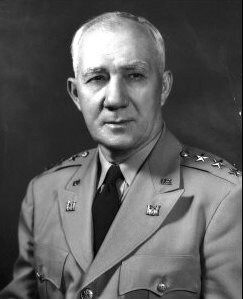 Pick was assigned to the China-Burma-India Theater of Operations in October 1943 and oversaw construction of the Ledo Road in India and Burma. His driving force enabled the difficult task to be completed in 2½ years. His men nicknamed the road "Pick's Pike". After his return to the United States in 1945, he served again as Missouri River Division Engineer. On March 1, 1949, President Truman appointed him Chief of Engineers. Pick was awarded the Distinguished Service Medal with Oak Leaf Cluster. He died December 2, 1956, in Washington, D.C.